February 11th, 2019, Prof. Jouke de Vries, president of the Board of the the University of Groningen, Mr. Wout Prins and Dr. Frits Bliek on behalf of the Ocean Grazer B.V. signed a license agreement covering two Ocean Grazer patent (applications). 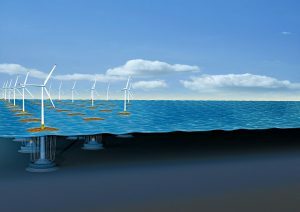 The Ocean Grazer harvests renewable energy from sea waves, integrating wind and other clean energy production and storage on site. This Ocean Grazer environmentally friendly concept converts energy from waves via an ingenious system of adaptive buoys, which together form a so-called floater blanket. The buoys in turn drive pistons that pump water from the internal reservoir at low pressure into a flexible bladder that is exposed to the high hydrostatic pressure at the bottom of the sea. This pressure difference provides on-site potential energy storage for the system. Ocean Grazer B.V. is a Dutch start-up. The Ocean Grazer concept has been developed at the laboratories of the University of Groningen since 2014. The license transfer has been prepared by Northern Knowledge Business Development and IP and gives Ocean Grazer B.V. the green light to further develop and to bring the Ocean Grazer to the market. Wout Prins is foun-ding father of the Ocean Grazer concept. Ocean Grazer B.V. its office is located at Campus Groningen, Nijenborgh 4, City of Groningen, The Netherlands. Please check the Ocean Grazer website for more information.